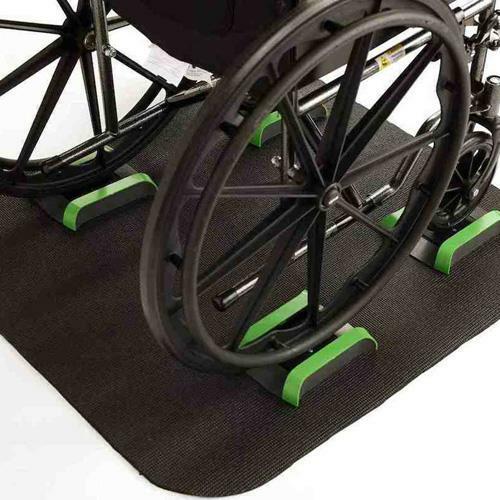 The Lilypad Scale is the first home wheelchair scale. It is portable and easy-to-use, and is designed for people with mobility difficulties to use wherever they go. The thin weighing pads are easy to roll onto, making the scale convenient and safe to use. The scale works with the free Lilypad app on a smartphone, allowing users to easily read their weight while using the scale. This lightweight scale can be rolled up for easy storage and transportation when not in use. Comes with four weighing pads that can be arranged to fit any manual wheelchair, as well as a mat to hold the pads in their places. Store Wheelchair Weight: The Lilypad scale app can store and automatically subtract your wheelchair weight. Weight can be stored automatically by the scale, or the user can input a known weight. Graph Your Weight: Weights measured by the Lilypad scale can currently be sent automatically to the Apple Health app, where they are recorded and graphed. Weight recording and graphing through the Google Fit app in Android is coming soon! Using the Lilypad Scale requires that you have a device with Bluetooth 4.0. The best way to check compatibility with your device is to search in the app store or the Google play store for the Lilypad Scale app. If you can see and download the app, then your device is probably compatible. If the app does not appear when you search, this means that your device is probably not compatible.